The above image was drawn for Kurt Busiek's blog by Joe Quinones (who drew Busiek's Green Lantern story so well for DC's Wednesday Comics a couple of years back). But you're probably wondering why Batman is eating his cake so protectively. I'll get to that. Last week I mentioned to one of my fellow teachers (who is a fan of comics himself) that the current Cartoon Network DC Nation Green Lantern series is so very, very good. His response was, But why did they make a Green Lantern cartoon anyway? Why not just make a Batman or a Superman? The answer, of course, is that there will always be another Batman or Superman cartoon. Why not try something different in the meantime! Thirty-three flavors, not just two! This new GL series mines the Green Lantern Corps mythos wonderfully, leading to stories that could not and would not be told with Batman or Superman. So don't eat Batman's cake; it's his. And don't offer him a ring either. Let him be Batman! You can visit Kurt Busiek's blog over here. My favorite comic book of the last two months was Popeye #1 from IDW. Why? Because it's a great comic book with a complete story. No, this is not a company-wide Court of Goons crossover issue. There aren't any even double-page splashes to add to the "drama." But there is a clever and entertaining story by Roger Langridge and great artwork by Bruce Ozella, both of whom are perfect for this series. Plus, the comic is printed on real paper, not that shiny stuff that DC and Marvel think readers prefer. 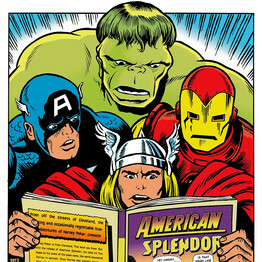 It's our responsibility as comic book fans and readers to always be on the lookout for anything new and wonderful. I try to do my part by passing on the word about great comic books like Popeye or Mudman. Don't lock yourself into a box or wear blinders. There are plenty of great comic being published today. You just have to look! Vince Colletta has never been my favorite comic book artist. But still. Back here I showed you an "Unwrapping Video" for the hardcover reprint of Jack Kirby's Spirit World that was recently published. The video helped me understand exactly how to take the wrapper off the book and the edition is a wonderful collection of Kirby story and art. Colletta would soften Kirby's often-mannish woman and he would add texture to figures and backgrounds that worked especially well on “Thor.” There was a period where it seemed to click and the work, as printed, looked amazing -- and his inks were ideally suited to the book -- it worked. 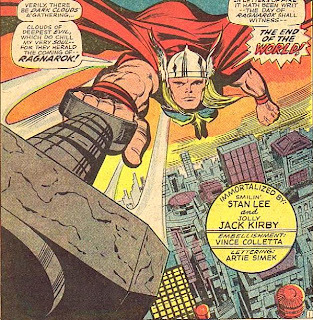 As much as I liked Joe Sinnott's incredible inks on the “Fantastic Four,” I think that line on “Thor” would have been too slick. Colletta's inks gave it an almost etching-like quality, which suited it perfectly. So what's my beef, you're wondering? On a closing page of the Spirit World volume, biographies appear of Jack Kirby and Mike Royer. But not one single syllable about Vince Colletta. 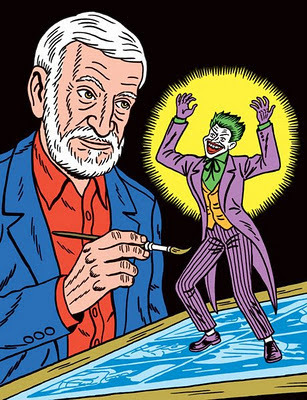 DC Comics had seen fit to hire Colletta as their Art Director in the mid-1970s but now they can't bring themselves to write a short entry about him for inclusion in this book? It's just not right. This is not a photo of Cesar Romero or Jack Nicholson or Heath Ledger. It is Conrad Veidt as he appeared in The Man Who Laughs. I was shocked at the weirdness and depravity of the 1928 film. Gypsy doctors performing surgical procedures on children to disfigure their faces into permanent smiles? Yikes! Unfortunately the movie drags on far too long, zooming right past at least three spots that would have served perfectly well as the ending. You can watch the entire movie on YouTube (now you tell me!) where it is split into eleven separate segments each running about ten minutes. The first segment is the best one (interestingly, it has been viewed seven times as often as some of the later segments) and you can sample it yourself over here. Published in today's Wall Street Journal, here is possibly the most negative article I have ever read about comic books. I was writhing as I read it. Thinly veiled as a book review, the article does its best to indict the mass market comics of today and those who produce them. Author Tim Marchman does make some good points in his scorching piece but I would be curious to know what fuels his anger that freely drips from every paragraph. Isn't he a baseball columnist? Every comic book fan should read this article for himself or herself. I mailed a hard copy of my article to Jonah Hex co-writer Jimmy Palmiotti in care of publisher DC Comics, just because I wanted to share the love. But you'll never guess what happened next! The letter was returned to me, unopened, RETURN TO SENDER written in black marker on the envelope. Thanks a heap, DC Comics! Without identifying at the time what I had sent or to whom, I wrote about An Experiment in the Hayfamzone, Part One in early 2007. You can read at the end of that article that I intended to try re-sending my letter (to Mr. Palmiotti) and see if I would have better luck breaking the barrier. Sometimes it takes five years but, yes, we do follow up on things in the hayfamzone! I now follow Jimmy P on twitter and I will direct-send him a link to this article you are now reading and I'm fairly certain he will finally get to read what I had meant for him to read so long ago. Hooray! The subtitle of this article that you are presently reading is An Experiment in the Hayfamzone, Part Two. Case closed! 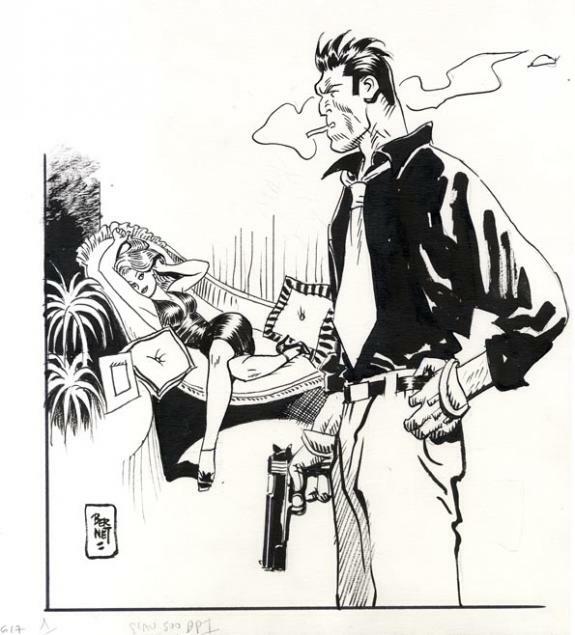 I invite you to read more about Mr. Bernet over on Wikipedia, and let's close off with a drawing by Mr. B of his own character. Sheldon Mayer GLX SPTZL GLAAH! Sheldon Mayer was a genius of comics! How much I enjoyed reading his Scribbly when I was a teenager and what immense satisfaction coursed through my veins when I completed my Sugar and Spike collection in the 1980s. 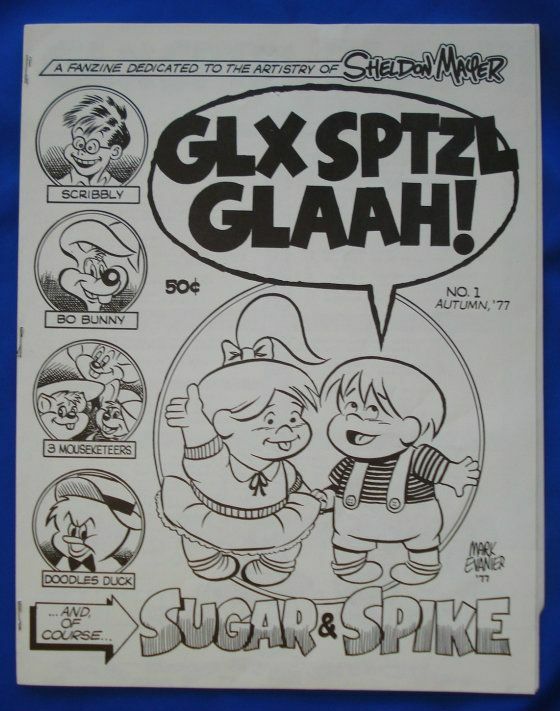 Many collectors feel just as strongly about Mr. Mayer, and Jay Zilber and Ken Gale in 1977 boldly published GLX SPTZL GLAAH #1 as a love letter to a fabulous artist and writer. I am selling my copy of this fanzine over on ebay this week so I want to document the great publication before it leaves my fingertips forever. 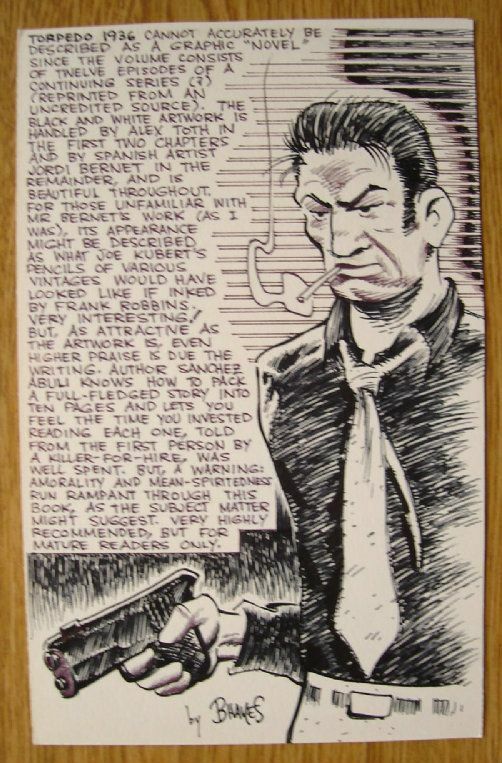 An article about Scribbly is written by Ron Goulart and one on Black Orchid is written by Rich Morrissey, plus some spot illustrations are drawn by then-letterhack and now-author-of-comics-and-novels Bob Rodi. Probably it's on the tip of your tongue to ask if I ever drew any Sugar and Spike images. (Don't be shy; we're all friends here in the hayfamzone.) The answer is yes! Twice, both times for my "column" in Alan Light's Buyer's Guide for Comic Fandom. My first take (from 1982) shows both tykes (especially Spike) drawn way off-model, but below you can see my 1984 return engagement with Spike. I will write far more in the future about Mr. Sheldon Mayer, but today was Glx Sptzl Glaah's day in the spotlight. 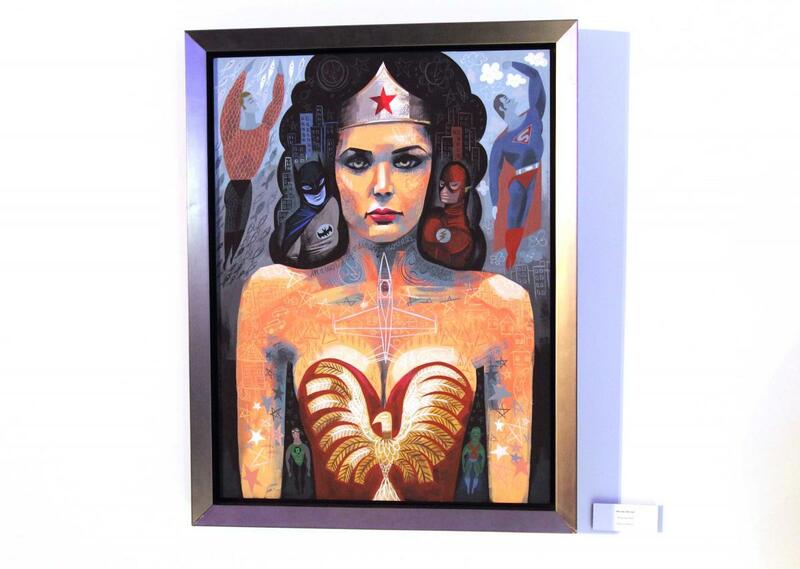 A little bird has tweeted to me that a Gallery Exhibition entitled Darkness and Light: Art Inspired by Heroes & Villains, Hope & Heroism had its opening in California this week. It will travel to other cities later this year but a schedule has not yet been announced. For now, you can read about the Exhibit and see more of its 100 original paintings over at this link. 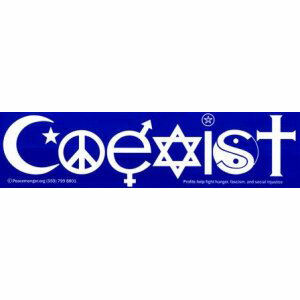 I have never affixed a bumper sticker to any car that I ever owned and I never will. But I saw one on a car when I was driving this morning and it impacted me sufficiently that I want to transcend comic-talk to share that sticker with you. It's in my nature to rank-order things into a list. I could tell you what my favorite restaurant in the world is or my favorite song of all time. In a past post I have already shared with you what my favorite music video of all time is. I never before gave a second's thought to rank-ordering any bumper stickers, but I can tell you without a doubt that the one I'm showing above is my favorite bumper sticker in existence. What better place to put that one-word hopeful command than on the bumper of your car where everyone you pass on the road will see it. Good advice, that's what I call that single word. And, since we're already off-topic (in for a penny, in for a pound, as we always say here in the hayfamzone), we might as well ride our bumper-stickered chariot into the sunset with this song. "Everybody loves a smoking monkey!" 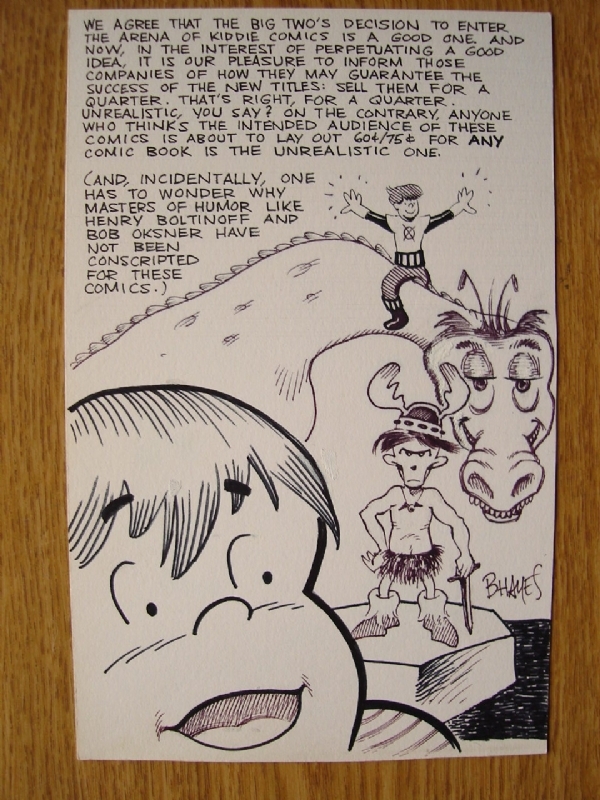 That was Lynda Barry's answer to a question last weekend as to why she often draws herself as a monkey. I've chosen a non-simian L.B. self-portrait to share with you above but I encourage you to look at her many self-representations over here. I found Ms. Barry to be the rollicking highlight of the already-excellent Comics Philosophy and Practice conference at the University of Chicago. I tweeted "If I were a network television executive I would on the spot offer a show to Lynda Barry" during one of her panels. An excellent article about the conference appeared in The Chicago Tribune and you can read it over here. Some great news for anyone who missed this comics event is that all three days of the Live Webcast of the conference will be posted on the University of Chicago website! I will let you know when those videos are ready for viewing. The Comics Philosophy and Practice conference at the University of Chicago moves into its second day today. Charles Burns, Daniel Clowes, Chris Ware, and Seth will be on a panel entitled Graphic Novel Forms Today at 2:30 p.m. CST, and I am especially looking forward to the appearance of Robert Crumb at 4:15 p.m. (The movie Crumb was wonderful but I have never seen the gentleman in person.) The schedule for the entire conference can be viewed here. As was true yesterday, all of the presentations and panel discussions will stream live on the internet! The conference organizers are tweeting that some seats in the auditorium have become available because of NATO-related cancellations, but I will probably watch it from home in my pajamas rather than take the chance of being turned away. Here is the link to the Live Webcast (which did stream very smoothly yesterday). During the Webcast they display a live twitterfeed side-by-side with the frame showing the main event, and yours truly was right there shooting out the tweets (one of which sufficiently touched a nerve that a fellow tweeter responded to it). Of course I invite you to Follow me over on twitter! It's a beautiful day in Chicago, and so very many things are occurring across the city. There is a NATO gathering on the south side, the Cubs are battling the White Sox at Wrigley Field on the north side, and the first day of a weekend conference about comics is convening on the campus of the University of Chicago. The conference is entitled Comics Philosophy and Practice, and I have a feeling that many of you have not heard advance word of it. But I have an additional feeling that you have heard of many or most of the speakers at this conference. Scheduled to be in attendance are Robert Crumb, Art Spiegelman, Daniel Clowes, Chris Ware, Charles Burns, Lynda Barry, Justin Green, Seth, and nine other great cartoonists. As you can tell by those names, this is a comic book convention of a different stripe. I had planned on heading over to the conference so I could report to you about it, so I was upset yesterday to read on the conference website that registration is closed. They are full to capacity and nobody else will be admitted. But wait! I read further and was delighted to learn that all of the presentations and panel discussions will stream live on the internet! This is great news for you no matter where in the world you are. Art Spiegelman will get the ball rolling tonight at 6:15 p.m. Please keep in mind when you look over here at the Comics Philosophy and Practice website that all times listed in the schedule are in Central Standard Time. That same link is your gateway to the Live Webcast of the conference. I am anxious for the festivities to begin! 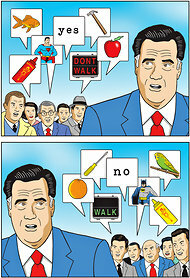 Again with The New York Times. They had an article last week about how you can channel and defuse your anger into a cartoon that you draw. They say that the process of drawing gives you a catharsis and then you'll be happy again. It seems like a funny angle to take, though. 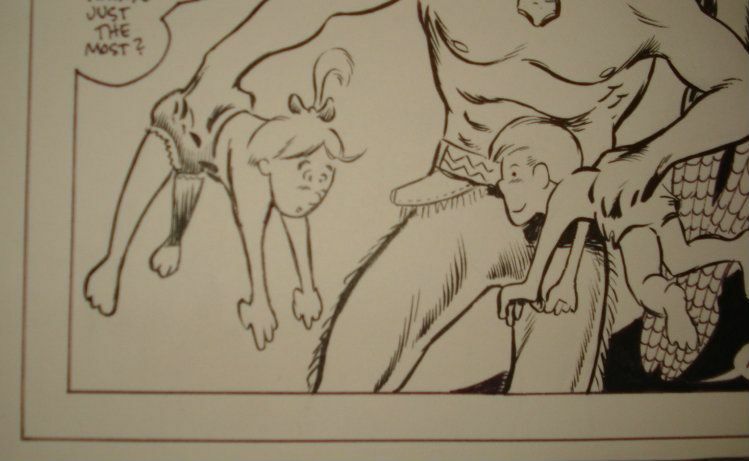 Why not draw a cartoon when you're happy about something and thereby multiply your happiness? Drawing is a wonderful exercise no matter what mood you're in. And you don't need to be Alex Ross or Lou Fine to put your thoughts to the drawing pad; anybody can draw a lopsided circle and put two dots for eyes and take it from there. The article is over here. Have you stumbled across the relatively new phenomenon of the "unboxing video?" YouTube currently has about 450,000 of them posted! Somebody videos himself opening a box containing a new computer or a new cell phone, and then the video is put up on YouTube to show future purchasers of the item what they can expect. Now it seems that this concept is extending to the unwrapping of new books. A nice reprint of Jack Kirby's wonderful 1971 Spirit World was recently published by DC Comics, and I know exactly what I will be dealing with when I get my copy because of the "unwrapping video" that you too can watch right over here. 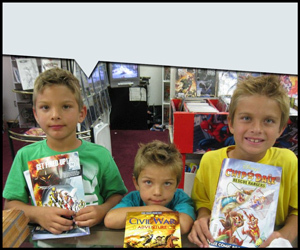 Free Comic Book Day is a great idea! The above photo is from the FCBD website; I visit that page every year so I know ahead of time what titles will be available before I set foot in the comic store. One of the free comics I partook of was the DC Comics New 52 Special Edition. Quite a mouthful! I wish the comic could have been all story pages and no house ads, but writer Geoff Johns was in fine form. At long last the Phantom Stranger gets a sort-of origin story. (I suppose some youngsters don't realize that the Stranger had a 1970s series with wonderful Jim Aparo artwork, and maybe even some oldsters don't know that the same Stranger had a 1950s series with just-as-wonderful Carmine Infantino artwork.) I am grateful to Rich Johnston of Bleeding Cool for pointing out a significant detail that had escaped me in the new story; how characteristic of Geoff Johns to retrofit this detail into an aspect of the Stranger's garb to which nobody had ever previously assigned any significance! Do you know the cartoon sound effect of a dog chomping down on something? I think it's funny every time I hear it! You can listen to it yourself by clicking on the button over here. Well, that's the sound of me chomping on the bait that a treacherous trickster left out for me! In the previous post I wrote about how there was a person named "Mando Baxter" living in Phoenix. Ha ha ha. If only I had gone to that "person's" Facebook page instead of just reading the summary on the Search Results page. Because then I would have seen in the photo field an image of Reid Fleming. And I would have known that it was a put-on. That there really is nobody named "Mando Baxter." The oldsters among you will remember that Reid Fleming, World's Toughest Milkman, was a highlight of the independent comics world of the 1980s and into the 1990s. Yes, it was a comedy, and Reid Fleming was a psychotic who would start fighting with anybody at the drop of a hat. If different comic book characters could be acquainted with each other, I think Reid Fleming and The Flaming Carrot would be the best of friends. You got me good, "Mando Baxter." But still, I'll do you a favor. Go ahead and update the image on your Facebook page with the below photo of Reid Fleming that I found. Unbowed by this turn of events, I went back to Ye Olde Searche Engine and you'll never guess what I found. In Florida there is a lady named Mandy Baxter Hudson!